Not to be confused with Lincoln, Missouri. 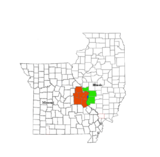 Lincoln County is a county in the eastern part of the U.S. state of Missouri. As of the 2010 census, the population was 52,566. Its county seat is Troy. The county was founded December 14, 1818, and named for Major General Benjamin Lincoln of the American Revolutionary War. Lincoln County is part of the St. Louis, MO-IL Metropolitan Statistical Area. According to Goodspeed's History of Lincoln County, Missouri (1888), Lincoln County was named by Major Christopher Clark, the first permanent white settler in an address to the Territorial Legislature. He said, "I was born, sir, in Link-Horn County, N.C., I lived for many years in Link-Horn County in old Kain-tuck. I wish to die in Link-Horn County, in Missouri; and I move, therefore, that the blank in the bill be filled with the name Link-Horn." The motion was carried unanimously and the clerk, not adopting the frontier parlance of the Major, wrote "Lincoln" in the blank space of the bill. Others[who?] say it was named for Major General Benjamin Lincoln, who served in the Continental Army during the American Revolution. According to the U.S. Census Bureau, the county has a total area of 640 square miles (1,700 km2), of which 627 square miles (1,620 km2) is land and 14 square miles (36 km2) (2.2%) is water. The county's eastern border with Illinois is formed by the Mississippi River. As of the census of 2000, there were 38,944 people, 13,851 households, and 10,554 families residing in the county. The population density was 62 people per square mile (24/km²). There were 15,511 housing units at an average density of 25 per square mile (10/km²). The racial makeup of the county was 96.13% White, 1.74% Black or African American, 0.37% Native American, 0.17% Asian, 0.03% Pacific Islander, 0.43% from other races, and 1.14% from two or more races. Approximately 1.14% of the population were Hispanic or Latino of any race. 37.7% were of German, 17.0% American, 10.9% Irish and 7.4% English ancestry. In the county, the population was spread out with 30.00% under the age of 18, 8.10% from 18 to 24, 30.20% from 25 to 44, 21.00% from 45 to 64, and 10.80% who were 65 years of age or older. The median age was 34 years. For every 100 females there were 98.40 males. For every 100 females age 18 and over, there were 97.90 males. The Republican Party mostly controls politics at the local level in Lincoln County. Republicans hold all but five of the elected positions in the county. Lincoln County is divided into three legislative districts in the Missouri House of Representatives. District 40 — Jim Hansen (R-Frankford). Consists of the northernmost section of the county. District 41 — Randy Pietzman (R-Troy). Consists of most of the entire county and includes the communities of Cave, Elsberry, Foley, Hawk Point, Silex, Troy, Truxton, and Whiteside. District 64 — Tony Lovasco (R- O'Fallon) Includes the southeast corner of the county and the communities of Chain of Rocks, Fountain N' Lakes, Moscow Mills, Old Monroe, and Winfield. All of Lincoln County is a part of Missouri’s 10th District in the Missouri Senate and is currently represented by Jeanie Riddle (R-Fulton). All of Lincoln County is included in Missouri’s 3rd Congressional District and is currently represented by Blaine Luetkemeyer (R-St. Elizabeth) in the U.S. House of Representatives. Former U.S. Senator Hillary Clinton (D-New York) received more votes, a total of 3,490, than any candidate from either party in Lincoln County during the 2008 presidential primary. ^ Eaton, David Wolfe (1916). How Missouri Counties, Towns and Streams Were Named. The State Historical Society of Missouri. pp. 185–186. ^ Breeding, Marshall. "Powell Memorial Library". Libraries.org. Retrieved May 8, 2017. ^ a b c d "Lincoln County - General Election - November 8, 2016". Lincoln County Clerk. November 14, 2016. Retrieved April 15, 2017. ^ a b c d "Lincoln County, Missouri Official Results General Election". Lincoln County Clerk. November 4, 2014. Retrieved April 7, 2016. ^ a b c d "Lincoln County, Missouri Official Results". Lincoln County Clerk. November 6, 2012. Retrieved April 7, 2016. ^ a b "Lincoln County, Missouri Official Results General Election". Lincoln County Clerk. November 12, 2018. Retrieved February 18, 2019.